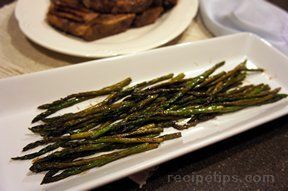 Roasted asparagus is a favorite around our house. Seasoned prefectly with just the right amount of vinegar for that added zing. Perfect for company and not much work to create this delicious vegetable. 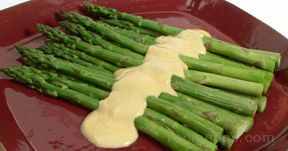 Clean asparagus. Line small baking sheet with foil. 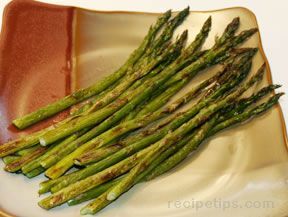 Spread asparagus spears in a single layer on baking sheet. Drizzle with olive oil and balsamic vinegar; sprinkle with salt, pepper, garlic powder. Toss spears to coat. Make sure spears are in single layer again, sprinkle with sesame seeds, if desired. Bake at 350 degrees for about 10 minutes until tender crisp, or until desired doneness. NOTE: These can also be sautÃ©ed in skillet with same seasonings. 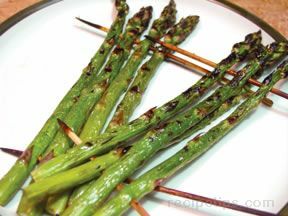 "I prefer simple roasted asparagus with just olive oil and no vinegar. I thought the balsamic vinegar was a bit much."